Another temptation at “helping’ the fawn is often just as deadly: feeding the fawn. It seems to be human nature to want to feed baby animals. Wildlife rehabilitators are constantly advising the public not to feed baby animals. Suddenly feeding any wild animal, whether that animal is in distress or not, will almost always cause it harm. With fawns, that statement is critical. 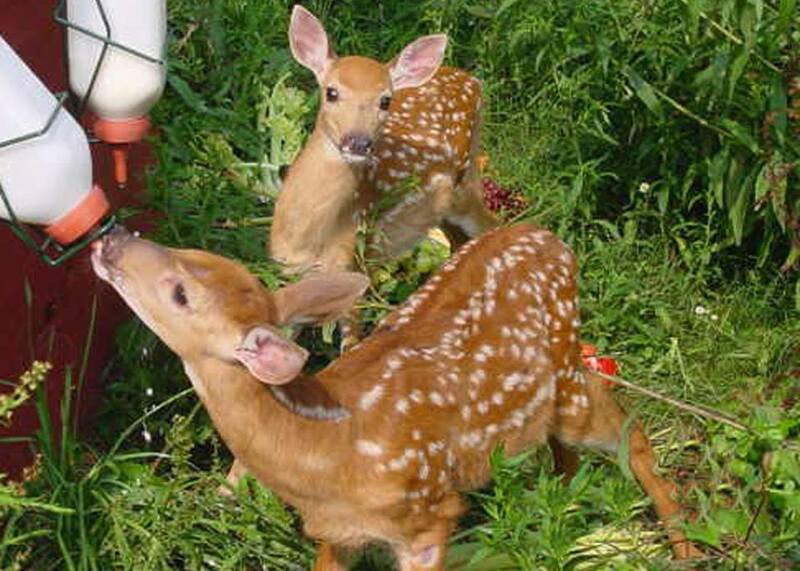 If a fawn is truly in trouble, perhaps injured and dehydrated, feeding milk to the baby deer can cause refeeding syndrome, a metabolic disturbance disrupting the amounts of insulin and electrolytes in the bloodstream. The effects are not immediate. Animals may rally from the sugars and fluid and appear as if they are recovering. Death can occur in 3 to 5 days. This syndrome is almost impossible to reverse. Most animals will die. A wildlife rehabilitator will attempt to give injectable fluids and vitamins, which are also depleted in starvation, but the damage is usually not reversible. We are often asked by people who find fawns if they should assist a foundling by feeding it, even though it appears healthy. But introducing a new milk formulation will result in the fawn’s getting diarrhea, which will attract flies that will lay eggs on the soiled fur around the fawn’s tail. Within one day, these eggs will hatch; and the maggots will enter the digestive system making the fawn sick, eventually killing the young deer.